What Makes Public Art Good? 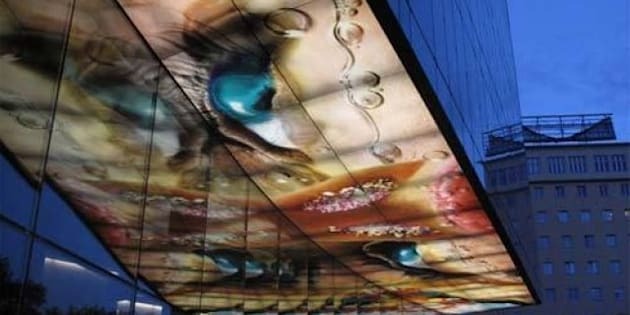 If audiences for art are passing through museums without stopping to consider the art, then putting art -- at an enormous scale -- on the ceiling of a restaurant, or in the middle of a public space or on the edge of a waterfront view would seems like a good idea. Although I don't blog about public art in Toronto, since it could create a conflict with my position on the City of Toronto Public Art Commission, that doesn't stop me from blogging about public art elsewhere. 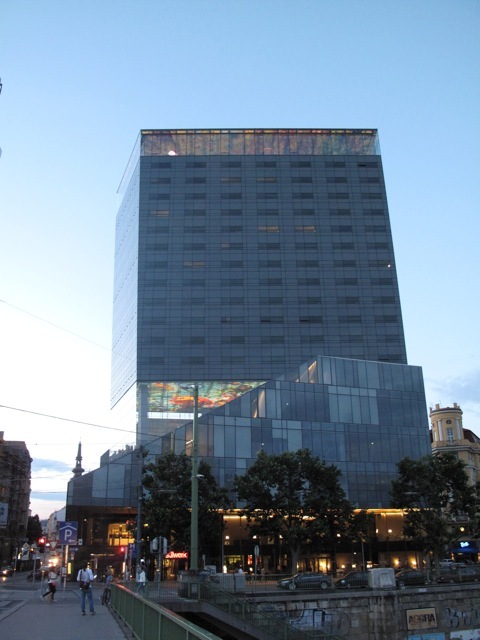 The entrance to the new Sofitel Hotel in Vienna. 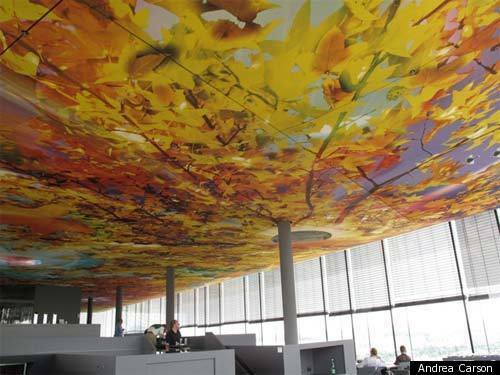 I was in Vienna, Austria recently and saw the most fantastic use of art in Jean Nouvel's new Sofitel hotel. Surprisingly unremarkable from the outside, there was an artwork by Swiss artist Pipilotti Rist that greeted us at the hotel entrance and really wowed us on the rooftop restaurant. I'm not sure if they have a per cent for art program there, which we have in many cities across North America (it gives a minimum of one per cent of construction costs of significant developments over to public artworks in newly built properties) but the hotel owners really gave an impressively enormous amount of space and visibility over to the artwork. 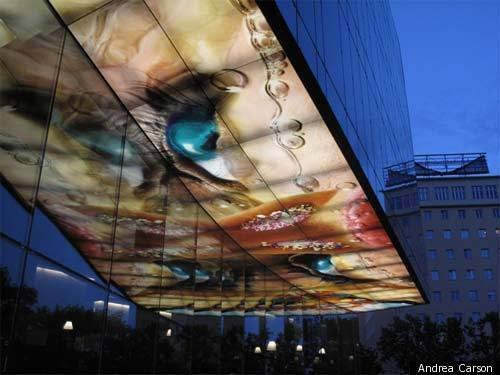 The awning over the hotel's entrance was lit up from underneath with an image that has viewers peering into Pipilotti's magical 'heaven.' You literally see up her nostrils. Then, you enter the very black elevator up to the rooftop lounge and restaurant. The entire restaurant from the chairs to the carpet, walls and bar is covered in matte, dark grey. 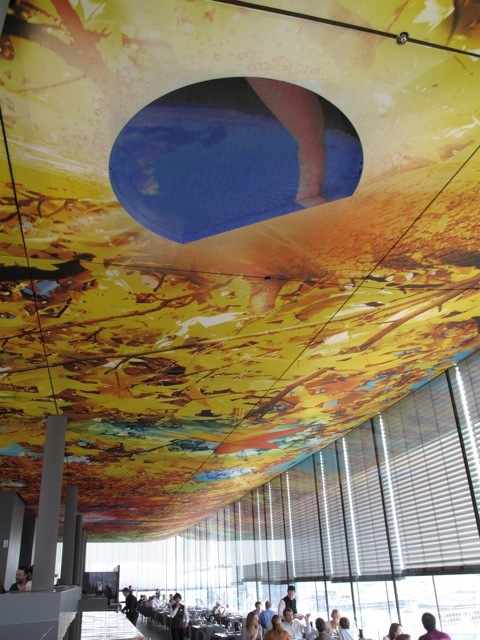 The only colour exists in a spectacular ceiling mural by the artist that covers the ENTIRE ceiling, which is also punctured with small circular video screens. 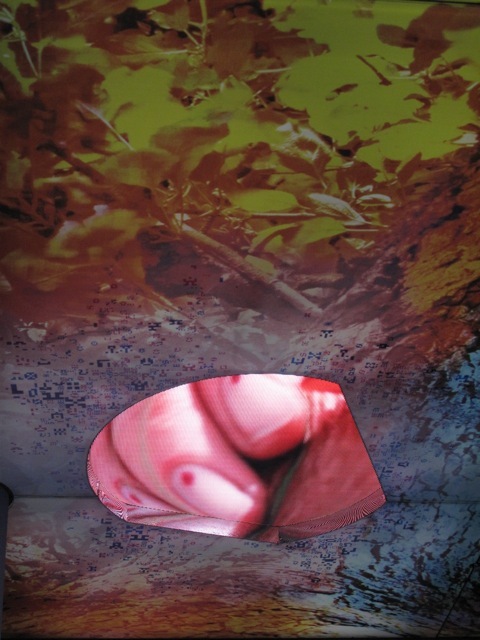 Through the screens you can see Pipilotti cavorting around, sticking her fingers down to pull you up into the ceiling. It's a stunning piece and a wonderful, unconventional use of space. 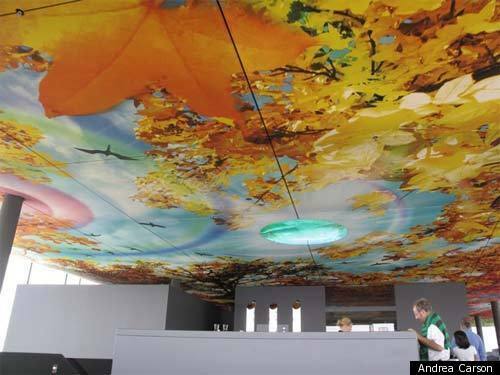 The best thing, though is that it engages your imagination -- it's as if there is a world beyond the ceiling. The bright colours are the perfect foil for Nouvel's austere black building, in which everything is black, minimal and cool. It's the masculine and the feminine, the serious and the playful, the grownup and the childlike. It's as if the place we really want to be is inside the artwork. The hotel seen from the exterior. 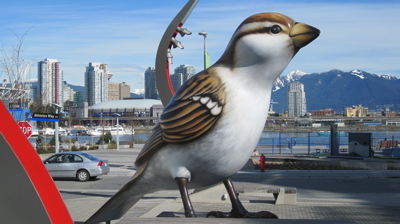 Closer to home, the city of Vancouver has some wonderful public art pieces -- particularly the large scale sculpture like the birds by local artist Myfanwy MacLeod at the Olympic Plaza in Vancouver's Southeast False Creek Plaza and the enormous raindrop by Berlin art collective Inges Idee at the city's convention centre. Like all successful large scale work (hello, Christo and Jeanne Claude) it draws attention to the environment around us. The street becomes an artwork, and the public becomes complicit. 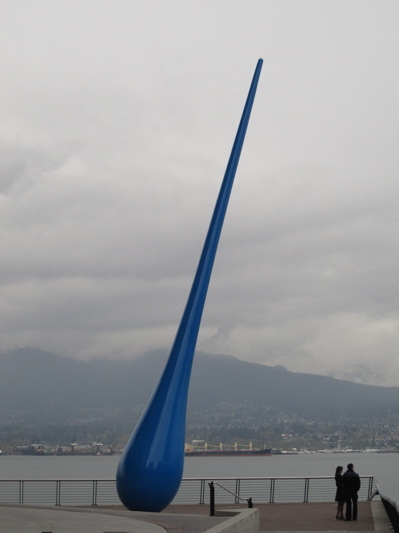 The Birds by Vancouver artist Myfanwy MacLeod. As Boris Groys points out in his book of essays Going Public, referring to contemporary means of communication like Facebook and Youtube, "Contemporary art has today become a mass-cultural practice. So the question arises: How can a contemporary artist survive this popular success of contemporary art? How can the artist survive in a world in which everyone can, after all, become an artist?" The Drop by the group of Berlin artists Inges Idee. One way is to place the artwork into a location where the viewer is able to properly contemplate it. 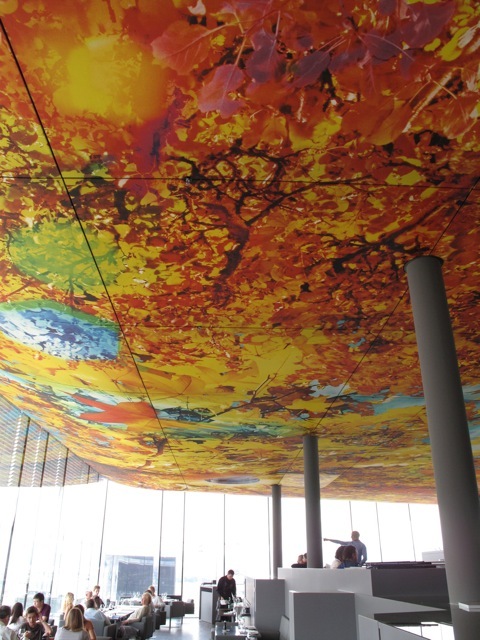 If audiences for art are passing through museums without stopping to consider the art, then putting art -- at an enormous scale -- on the ceiling of a restaurant, or in the middle of a public space or on the edge of a waterfront view would seems like a good idea.